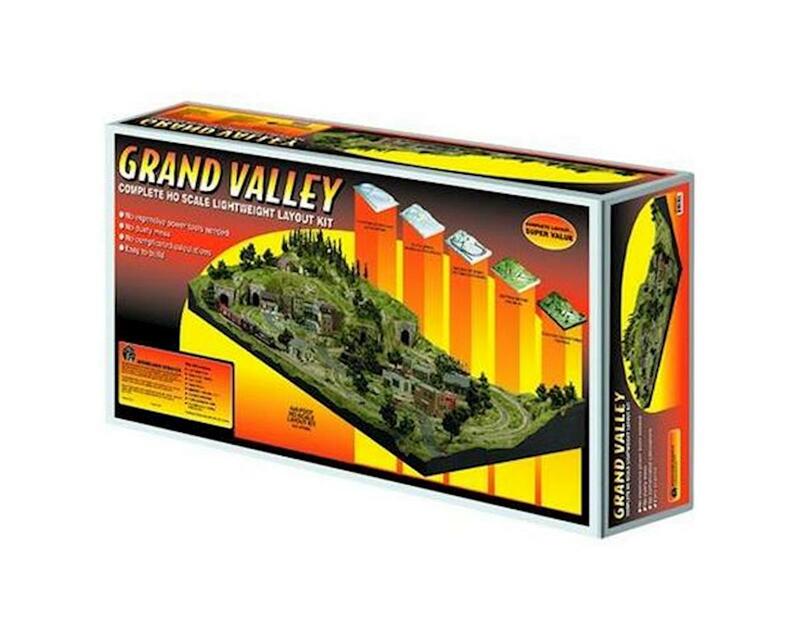 Grand Valley includes all the SubTerrain, Terrain and Landscaping items you will need to build this huge 4x8-foot layout. Use Risers and Inclines to create hills, mountains and low-lying areas on your layout. Use Foam Sheets to make flat, elevated areas for towns and buildings. Cover with Plaster Cloth for a hard terrain covering. Then make and install rocks and add tunnel portals and culverts. Landscape with a wide variety of ground cover, trees, accent details and other scenery products for a great layout. When completed, our layout kits are so lightweight and sturdy that you don’t need plywood or any other structure underneath to support them, but they can be set on our Square Module Kit Stands. Because they are so lightweight (lighter than the box they come in), they easily can be moved anywhere.